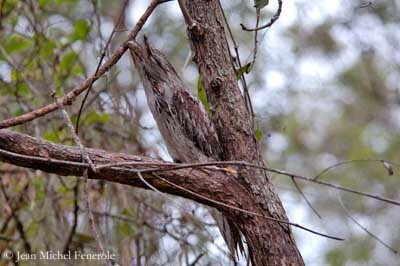 Tawny Frogmouth is one of the best camouflaged in the world. When perched in tree, it is very difficult to find it if motionless. It resembles owls, but it is related to nightjars. Adult male has silver-grey plumage overall, with slightly paler underparts and darker tail. Plumage is finely streaked with black, and slightly washed with rufous on forehead, scapulars, back and flanks, giving the bird its “bark” appearance. We can find a second morph with reddish-brown plumage. In both phases, strong bill is greyish to blackish, with conspicuous rectal bristles tufts on bill top. Bill is large, triangular and hooked. This bird has huge frog-like mouth adapted for hunting. Eyes are deep yellow. Short legs and weak feet are greyish-brown. Both sexes are similar, with male larger than female. Chicks are covered with whitish down at hatching. They resemble adults very soon in colour and have very wide open mouth when fed by parents. Tawny Frogmouth is widespread in its range. The main threat is on the road, when the bird sits on it at night, hunting moths and other flying insects. It is often killed by cars during these chases. It is commonly seen throughout Australia, and this species is not endangered at this time. There are 14 species or types of frogmouths. Size and colour vary, according to the geographic range. Papuan Frogmouth – Podargus papuensis is larger (50 to 60 cm) with orange-red eyes. It lives in woodland and rainforest edges in the Cape York Peninsula and Queensland. 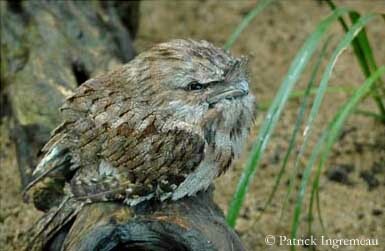 Marbled Frogmouth – Podargus ocellatus is similar in size (36 to 45 cm) with orange-yellow eyes. It lives only in north Queensland rainforests, and in Queensland-New South Wales border. Both species are also found in New Guinea and the Salomon Islands. Tawny Frogmouth produces loud clacking sounds with its bill. Booming call is a deep, continuous, rapid, nasal “ooo-ooo-ooo” grunting, with about 8 calls in 5 seconds. It can repeat this call through the night. If it is disturbed when resting by day, it can utter buzzing sounds, as bees. During breeding season, it makes some drumming noises. Tawny Frogmouth lives in wooded areas with clearings, wet tropical forest edges, and trees in urban areas, parks and even gardens. It avoids dense rainforests and treeless deserts. 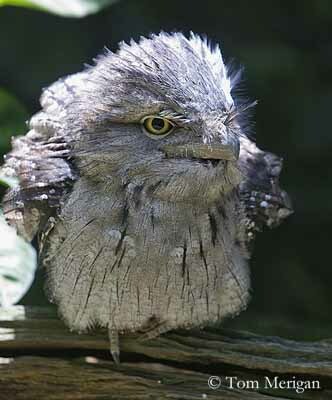 Tawny Frogmouth lives in Australia and Tasmania. Tawny Frogmouth feeds mainly on insects. It hunts usually by night, invertebrates and small vertebrates such as frogs and mice. It can catch flying insects, but most of time, the bird hunts from elevated perch, swooping down onto the prey on ground. 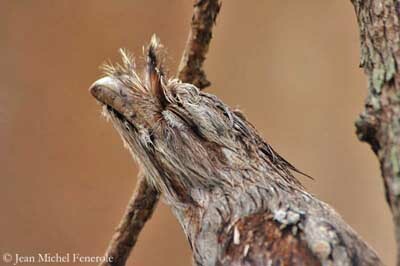 Tawny Frogmouth usually hunts at night, and spends the day resting on dead branch close to the tree trunk. Its streaked plumage provides and excellent camouflage. The bird stays upright, very close to the trunk, similar to the bark and motionless. It is very difficult to see it. This bird moves very slowly. Tawny Frogmouths are monogamous and the two mates stay together for life. This species is sedentary, staying in the same territory during several years. They live alone or in pairs, and sometimes in family groups. When threatened or alarmed, Tawny Frogmouth remains as a small branch in tree, with outstretched neck and tightly feathers on its body. Its cryptic plumage is its best protection. Tawny Frogmouth is the weakest flier in this order. It has rounded wings of moderate length. It has fringed first primary wing coverts, allowing silent flight. 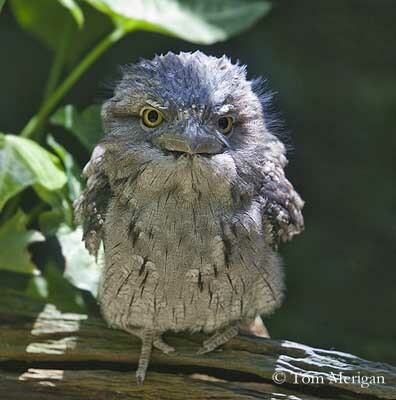 Tawny Frogmouth breeds from August to December. Birds living in arid areas may breed according to the rainfalls. Pair reuses the same nest each year. It is a loose platform made with sticks. Interior is lined with green leaves. Nest is usually situated in horizontal fork in tree, and built by both adults. They often have to repair the nest before new breeding season. Female lays 2 to 3 white eggs. Incubation lasts about 28 to 32 days, shared by both parents. Adults take turns during this period. Male incubates during the day and both sexes at night. Altricial chicks are covered with greyish-white down at hatching. They are fed by both parents. Nest remains clean, with chicks directing their droppings outwards over the rim. Young fledge about 25 to 32 days after hatching, and become independent. This species produces one brood per year, but birds of southern parts of the range may breed twice. 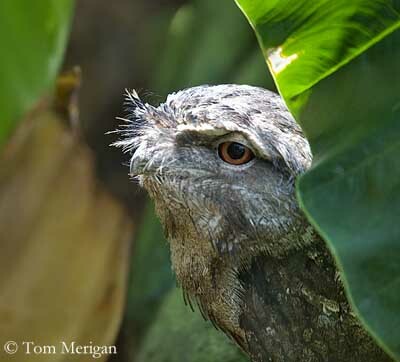 Tawny Frogmouth feeds mainly on nocturnal insects, but it also consumes slugs, snails and worms. It can eat small mammals, reptiles, frogs and birds, hunted from a perch by pouncing to the ground onto prey.